YASSSSS We’ve made it to the end of the One Room Challenge! While there’s been a fair bit of drama along the way, I THINK I’m accurate when I declare that this was my first ORC without an ugly cry. I consider myself a champion for that feat alone. 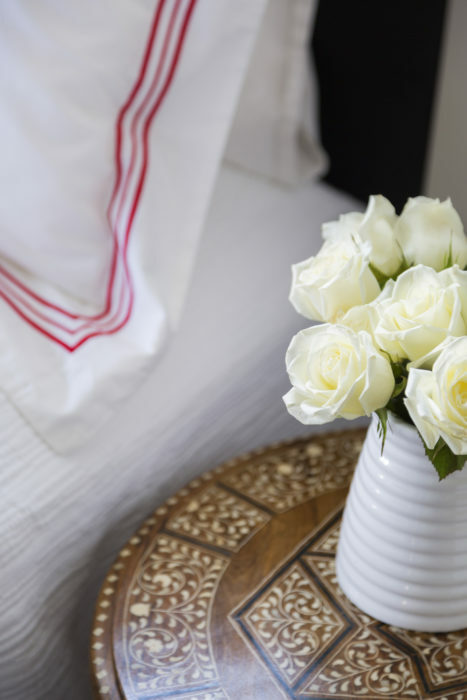 For those who have followed along on our seven-week bedroom and bathroom renovation journey – today is our payoff day. We will be sharing all the pretty AFTER photos with you just down below. For anyone who just needs a little refresher, here is our short and sweet recap. . . 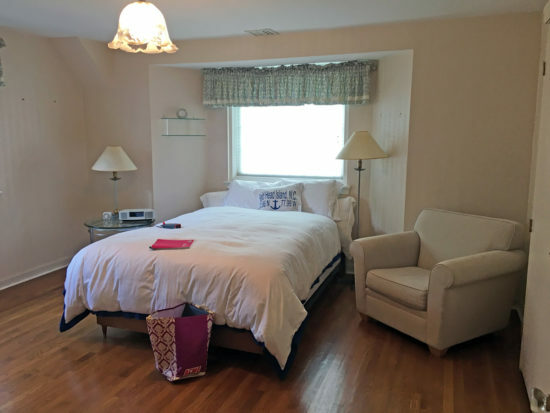 This project began over the summer when my longtime client, D, asked me to renovate and decorate her hall bathroom and her guest bedroom, which also doubles as a laundry. I knew it would be a fun project as I’ve already renovated nearly every room in her house, love her style, and know her so well. Decorating with D truly is playtime. 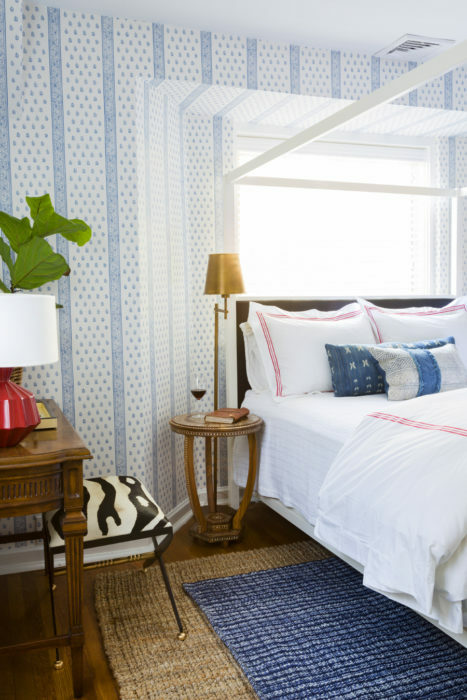 Her house is a blend of traditional and modern, old and new, colorful with crisp whites, full of patterns, and is a nice mix of preppy tailoring with bohemian accents. I knew the bed and bath would be designed with a similar mix – with their own unique translations, of course. Just as I was beginning to develop my first design ideas, Linda invited me to this season of the ORC and it felt like fate. I knew this was a project I wanted to share, and due to my client’s trust and our good planning, I felt confident we could complete it within the short timeline. Because of our generous sponsors, we were able to splurge on a few big ticket, game changer elements like the bedroom wallpaper and custom vanity in the bathroom. While backorders kept us from our dream bed, we were able to pull together spaces that I’m really proud of. I hope you guys love it too and that you’ll find a few elements inspiring or beautiful. I’d love to hear your thoughts as to what stands out to you! Welcome to the new guest room! 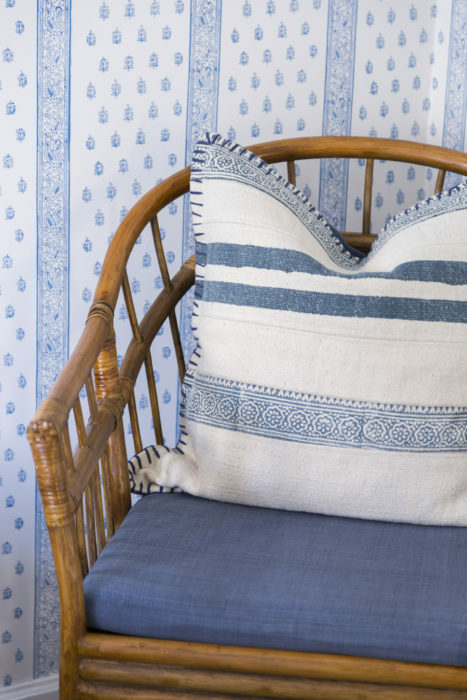 We strove to create a retreat that’s both relaxing and enchanting for either a guest to enjoy while visiting, or our client to adore while doing laundry. (More on the laundry below.) 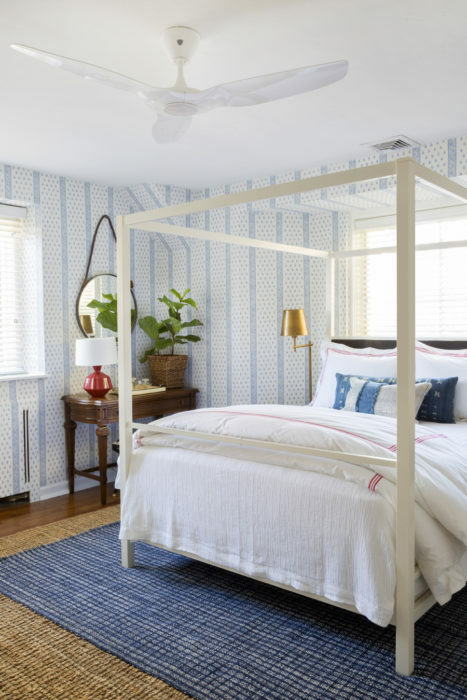 With our inspiration in mind – Preppy Bohemian with a British Colonial influence – we filled the room with a modern white canopy bed, lots of blue and white, vintage case goods, and furnishings, art & textiles sourced from India, Africa, and Asia. …turned into doors that I cat-call every time I walk into this room. Behind those doors, we improved the laundry set-up considerably. Before we had side-by-side machines with two saggy shelves above, and ironing/clothes hanging activities were spread out amidst the available floor space within the room. Drying racks are one of those very necessary things that NO ONE wants to see, so we had to find a way to hide that away. 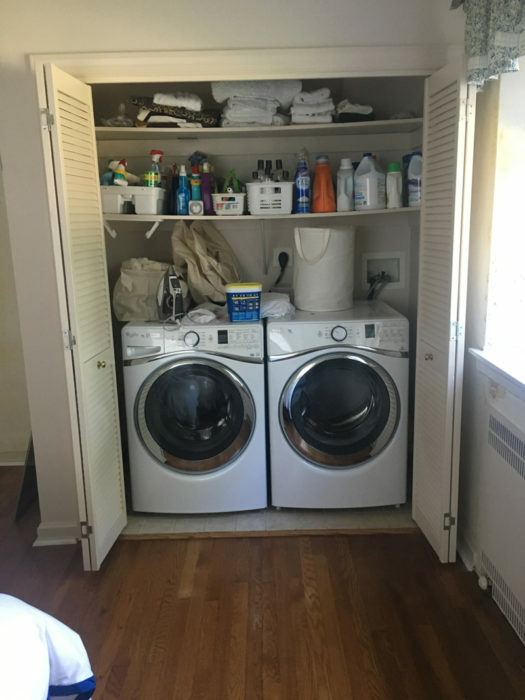 We stacked my client’s machines and added a hanging rod, a pull-out ironing board, and drying racks attached to the door. 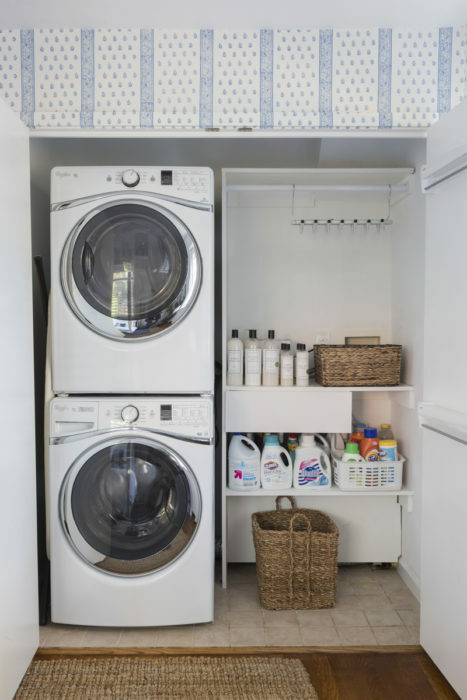 The best part is that you can close the door with the drying racks extended, so all those items can do their own thing behind our pretty papered doors. 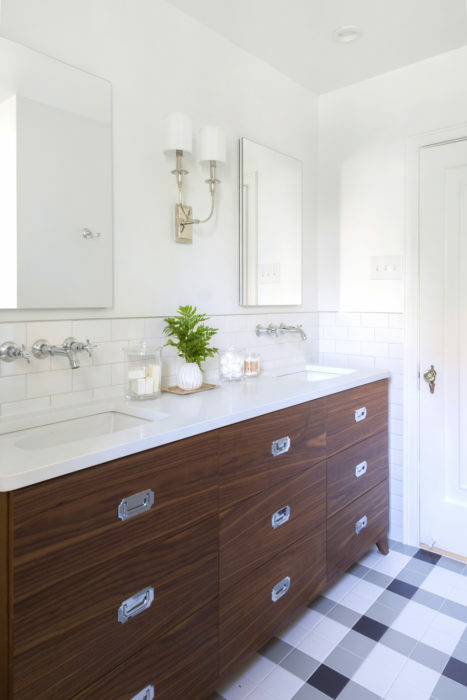 In the bathroom, we pulled off quite the transformation, and it was all made possible by simply moving the doorway less than 12” to allow for a double vanity. Due to the constrained space, we went with a custom shallow vanity cabinet that we had constructed out of walnut. Wall-mount faucets allowed us to have larger sinks and ample counter space. The result is a space that feels larger and more open, despite having much more cabinetry than before! We went big with our plaid floor, which seems to be a big hit with all of you guys (thanks for your support on that one!). The crisp white subway walls provide a nice balance to the statement floor. 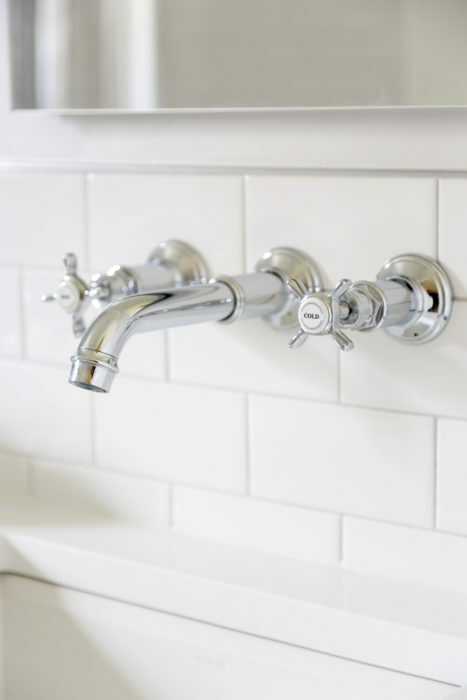 We kept the other elements clean with a few traditional embellishments on our faucets, lighting, and accessories. 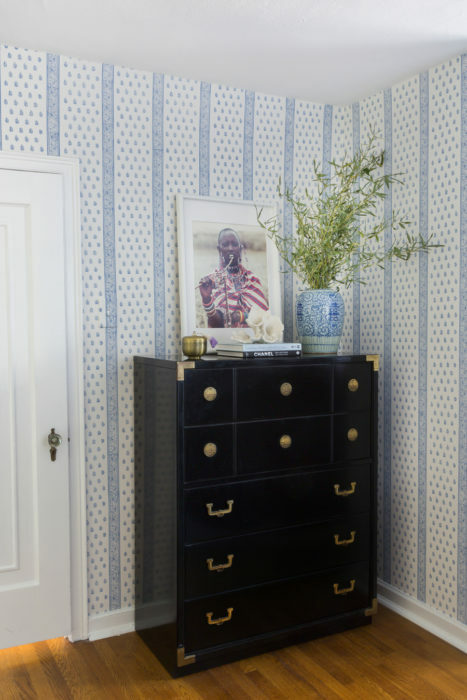 Our British Colonial influences are more subtle in here than the bedroom, but the warm wood chest styled with campaign hardware was a nod to that. Perhaps a blue and white bathroom would have been a more obvious pairing to the guest room, but we already have a blue and white kitchen in this house and I was excited to translate our theme with a more neutral palette. I could go on and on, but I know what you guys really want are the pictures! So I’ll let the rooms do the talking. I hope you’ve enjoyed the tour of our Guest Retreat. The space would not be possible without my amazing team, Chrissy and Tori, plus a special shout out to Buono Construction Group for bringing this space to life. Bryan Buono was truly a team player here, managing the project ahead of schedule, accommodating every request with a smile, and even ripping open new tile to raise up the shower head when needed. Lastly, thank you to my client, D, for trusting me, taking risks, having fun, stretching the wallet (just a little), and letting me run a 3-ring circus through your house for the last many weeks. Not many people want to share their dirty laundry, so I appreciate you letting us behind those doors. 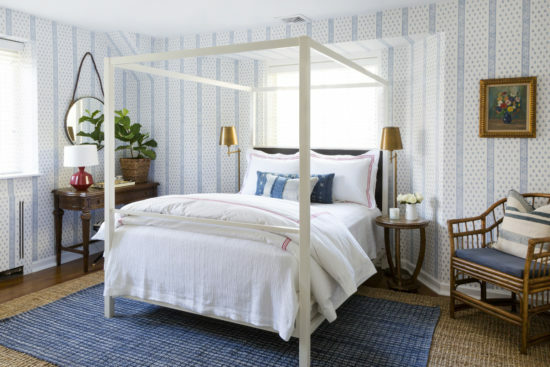 Awesome, I love white canopy bed. The room looks too cozy. What a beautiful transformation! I love the color palette that you used. It’s beautiful! New changes, it looks gorgeous! I only know that it will nurture and inspire great things! Wallpaper! I love it! Came out fantastic (I’ll admit that I had my doubts). Congrats on a job well done! It turned out beautifully! Any guest would love to come stay in such an inviting space! 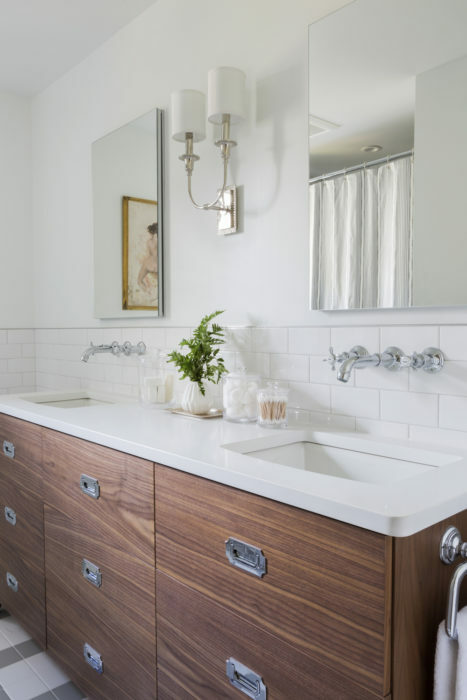 The shallow custom cabinet and wall mounted faucets is such a brilliant solution for the narrow bathroom! well done. Naomi, thank you for your brilliant creativity, extraordinary talent and generous spirit! It is so fun to read all of the accolades you are receiving – makes me so happy to see so many are discovering what I have known for years – you are a phenom!! 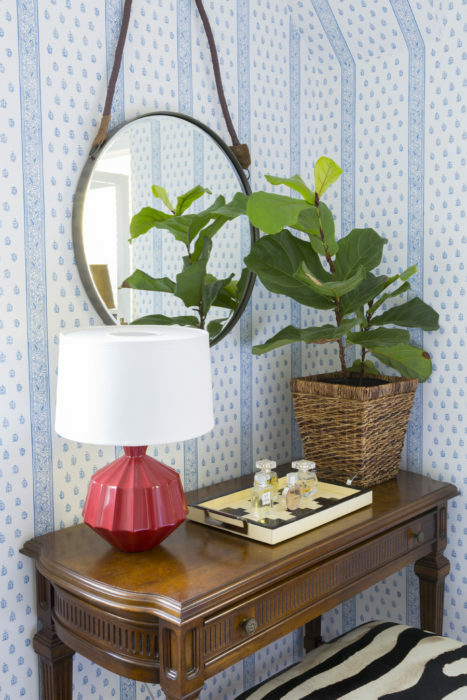 I adore these two new spaces (the wallpaper is sheer brilliance) and I love every room we have created together. My thanks to Brian and his team at Buono Construction, you smile with every annoying request I make, to Keith the wonderfully talented wallpaper artist, and all of the tradesmen and all of the Design Manifest team who helped make Naomi’s vision come to life and my house beautiful! Cheers, to you Naomi!! Thank you – that is so sweet and it means so much to me! I hope you have an amazing Thanksgiving with your first guests! Shut the door girl…..you freaking killed it with this one! 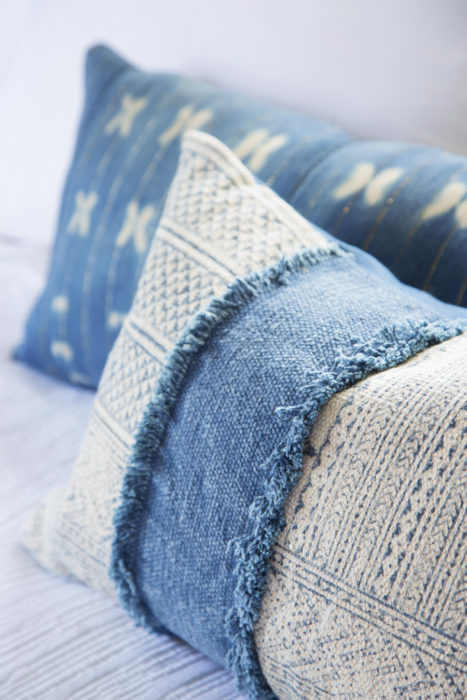 I could not love more…..every detail is total perfection! 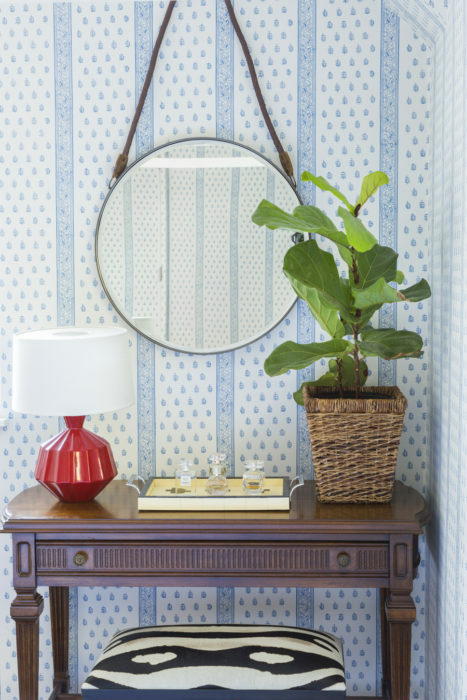 The floors in the bathroom….yes please and that Schumacher wallpaper was the absolute perfect choice. I bet your client is just thrilled! Thanks!! Yes, she is – which of course is the best part! This is truly amazing and more so because of the time constraint! The laundry doors are really a showstopper and that buffalo plaid floor…I don’t know what to say. Wonderful design and in my favorite color scheme, too! In love with that bathroom! Completely amazing and that shower curtain is honestly the best I’ve ever seen. Amazing. 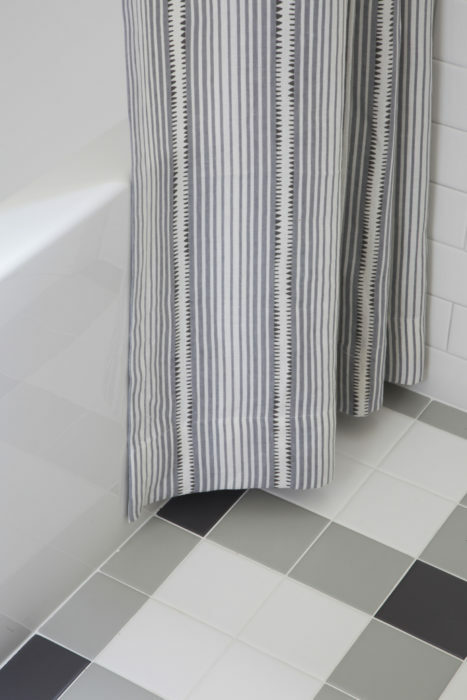 Thanks – it was fun to think outside of the standard shower curtain options! 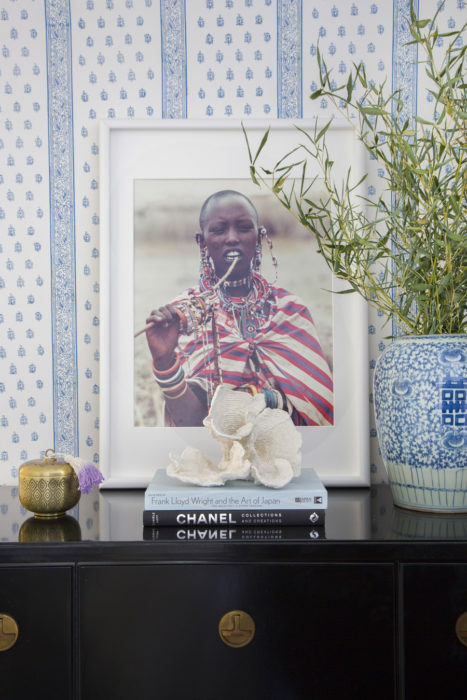 I’ve been following Design Manifest for several years and while I love everything you do, this is my tip top favorite! Love! Love! Love! You are a master! The touches of red sing (lady photo! lamp! 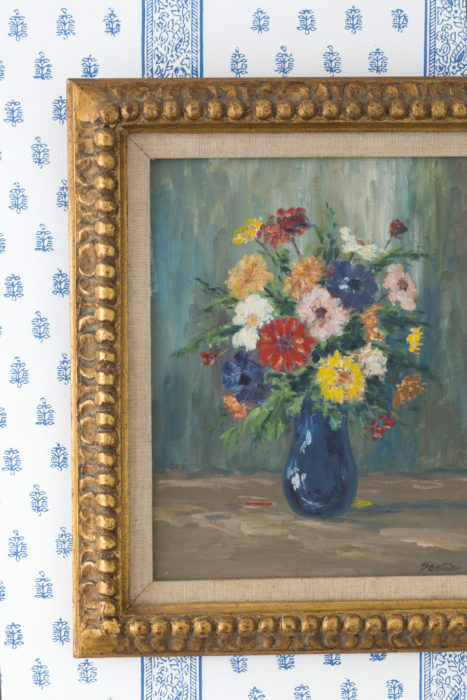 vintage flower painting!). 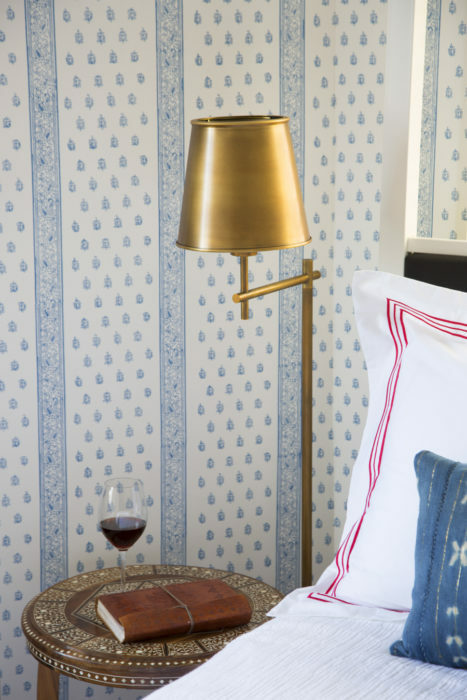 You nailed details huge and small (that wallpaper! those bone inlay tables!!). Maybe most of all though, I am always awed at your gift for making layout changes that enhance livability (Moving the bathroom door, wall mounted faucets…). Genius. Thank you!!! I relish a good space planning challenge. It’s definitely one of my favorite aspects of design. Love all of this. 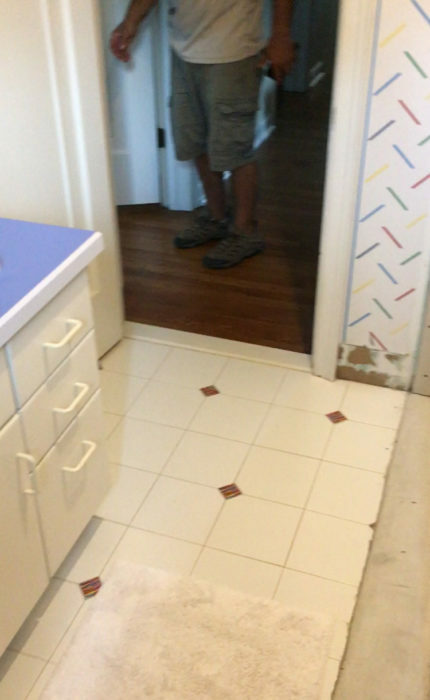 My favorites are the tile floor, wallpapered door and radiator. Brilliant. Lucky client. The wall paper is so pretty! Great job! Congrats! Thanks, I’m so in love with that paper, too! This is gorgeous! 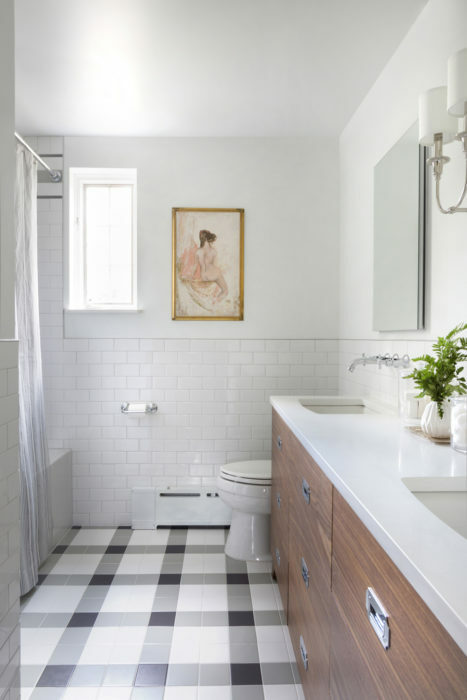 I love the tile pattern you created on the bathroom floor- so creative. And it’s such a great mix of styles. Timeless and fun…a perfect place to stay! pop of red–it’s pretty perfect. Great job! Thank you – finding the right mix is so much fun! Wow, absolutely gorgeous! So impressed that you tackled two spaces too. And incorporated so many gorgeous details… So well done! Thanks! Yeah, doing two rooms really emphasizes the ‘challenge’ in One Room Challenge 😉 but it was worth it! it is absolutely incredible Naomi! I knew I would love your rooms since week 1 and WOW now I am floored. 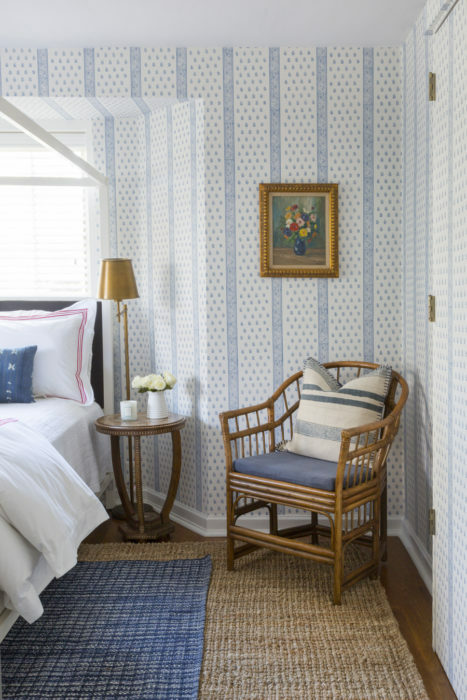 The wallpaper in the bedroom couldn’t be more perfect for the space and I love how it disguises all the corners in this room. 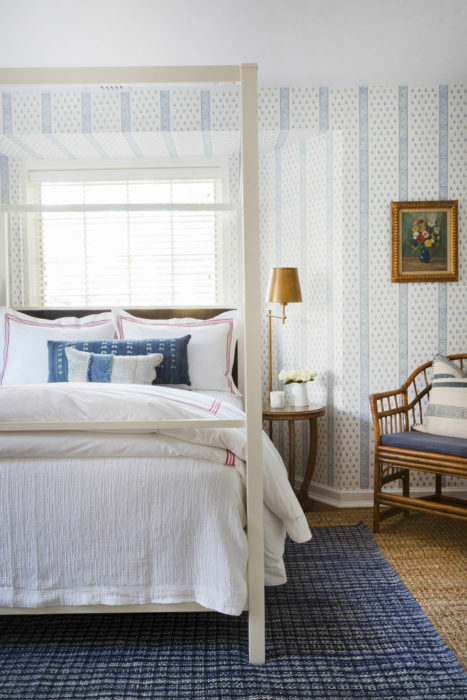 Fantastic idea to skip the drapery idea and have the bed right up the window to gain an extra foot or two. 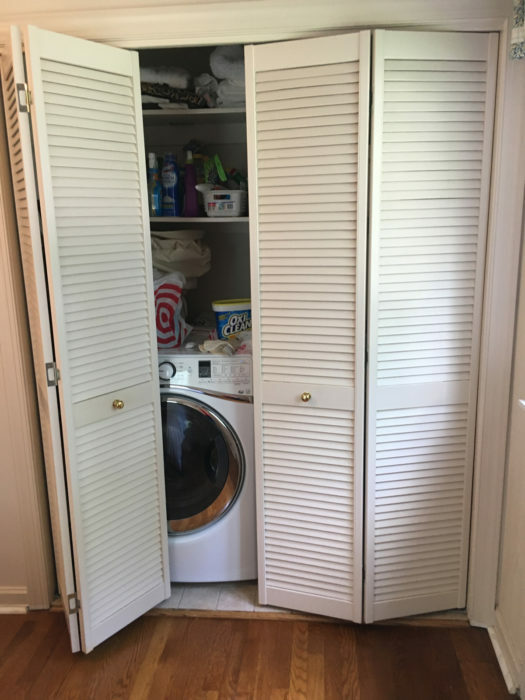 Those laundry doors … brilliant and I can imagine the work for that perfect pattern match from wall to trim to door. 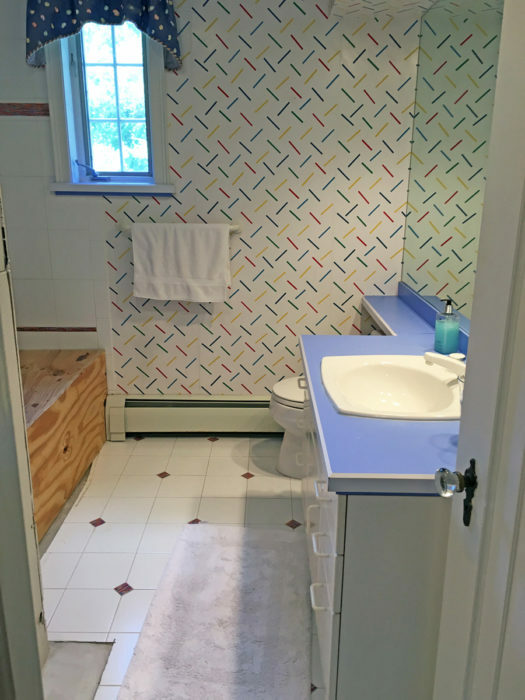 Now the bathroom, I am crazy about that tile pattern! once again shows that great design doesn’t need to break the bank. These are affordable tiles and it’s your creativity that makes them look like a million buck! 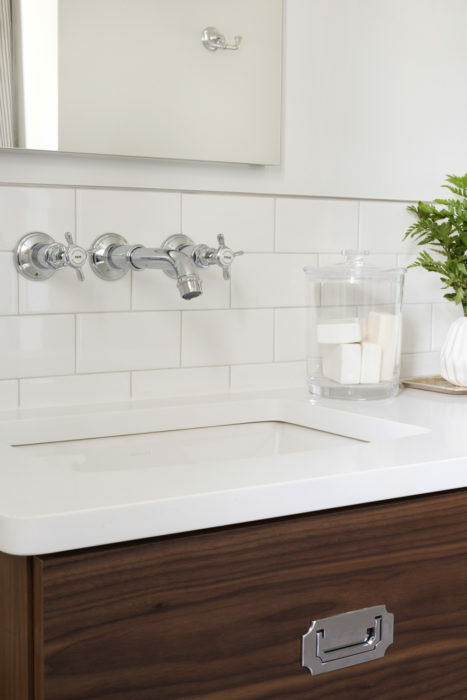 Great idea of wall mount faucet to give the extra space for a larger sink in a narrow vanity. 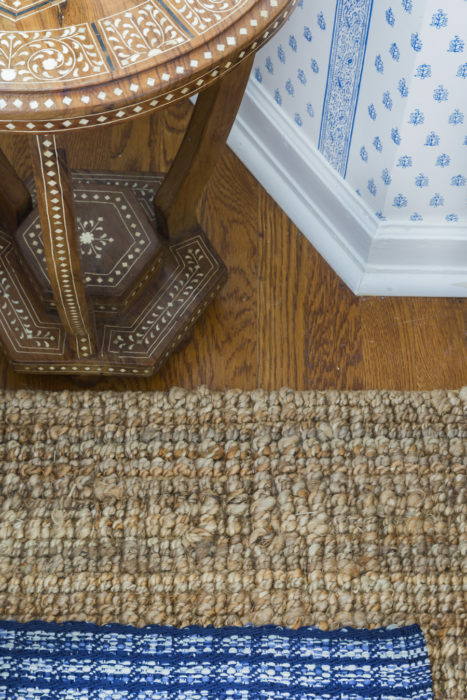 Tip noted for my next reno! BRAVO Namoi, what a journey but you did it! I love hearing what stands out to you. And yes my paperhanger is pretty great. You are only as good as your trades, right? I love the tile pattern! Great work! Thank you, it’s turned out to be a big hit – yay! So chic and lovely!!! The spaces all look fab. Nice work, friend! The ORC for me has always been synonymous with you and your blog! I always look forward to what you do, and feel lucky to ride alongside you this go around! this space turned out amazing, your client definitely won! Wow, thanks! That’s so sweet of you, I’m honored! You and your team are just phenomenally great!!!! Cant believe it’s the same space! Perfect Guest retreat! Shut the front door! I’m in design/sales at a kitchen and bath showroom in State College, PA and I had to do a double take when I clicked the link and realized the vanity was made in Lewistown!!! Talk about a small world! 🙂 Great project! Man, I love that paper! And papering the closet doors and trim was genius! Congrats on another great space! Thank you – I love that paper, too! And yes, so glad the closet doors turned out so well – it’s a fun detail! So beautiful!! Always love your reveals. 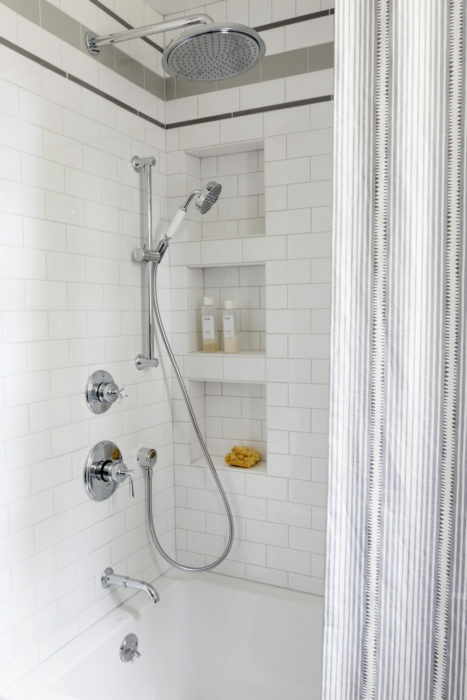 Can you please share the grout color you used with the white subway tile? Also, what is the silver edging/bullnose on the subway tile? Does the one double scone provide enough light for the bathroom? 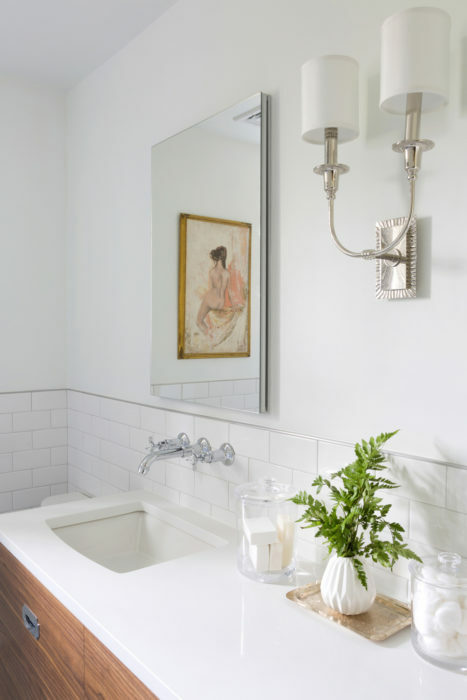 I have a similar vanity with wideset sinks where there is not enough room to put sconces on outsides of mirrors, but was hesitant to just use one sconce . The wall (subway) grout color is Bostik silver bullet h168. The floor is Bostik white h152. We used a metal schluter strip to trim the tile in a clean and contemporary manner. Each sink has a 4” recessed light directly above it. We always light vanities with a combination of overhead and side sconce lighting. Nailed it! Love everything. 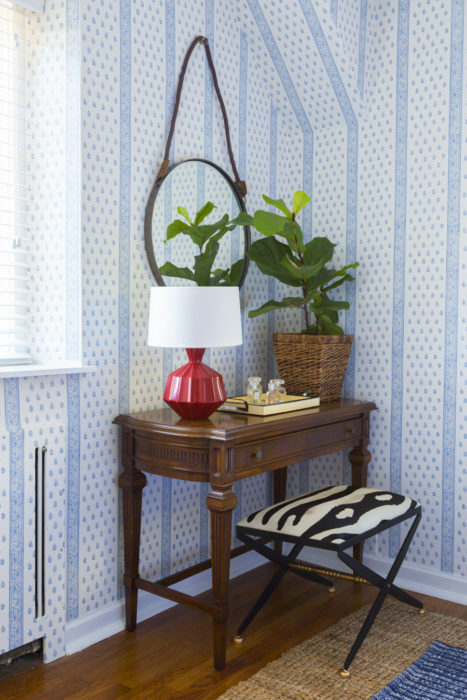 The pattern play is gorgeous and those closet doors are genius! Lucky client. gorgeous! can you share the source for the fantastic floor tile! Thanks so much! Yes – the tile is the 4-1/4″ ceramic from American Olean . You always knock it out of the park Naomi. 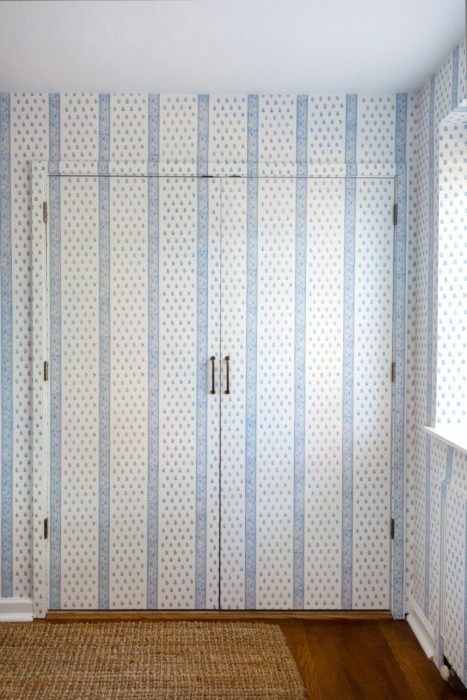 Love the wallpaper and how you papered the doors. The bathroom is perfection. Love the floor! Enjoy your well deserved long nap! Thank you Vanessa, I will! Oh my lord – the details! This room is so special, so gorgeous. Amazing job, Naomi! Both rooms turned out to be total perfection. You are a major source of inspiration for me! Your ORC reveals are always my favorite! 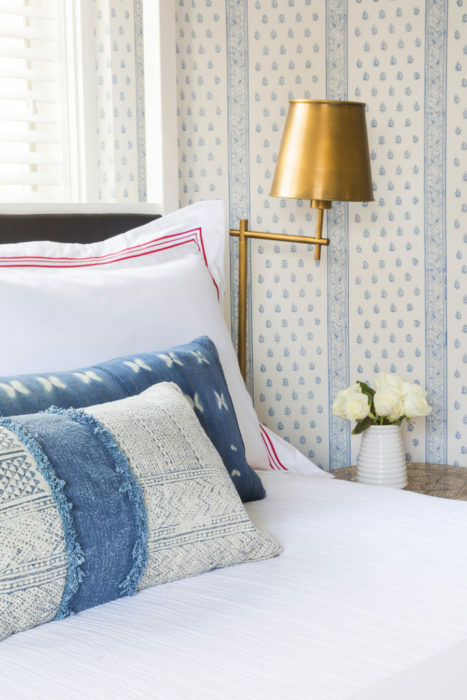 The guest room is beautiful with all those layered textures. 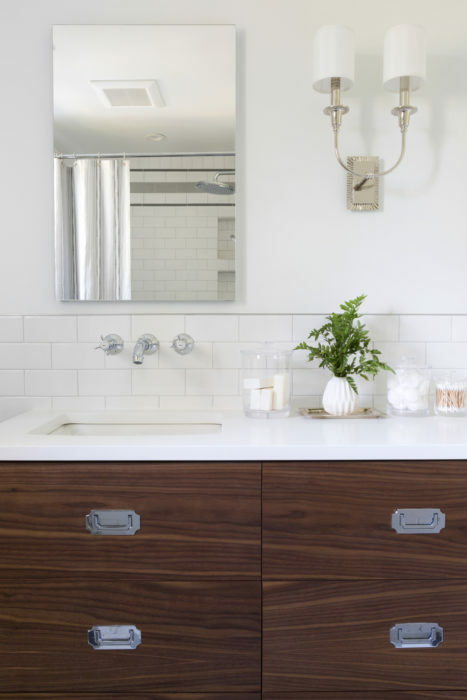 I love the walnut vanity in the bathroom with the wall-mounted faucets. So many great details! Well done! Aww, thanks Kate, I really appreciate it! © 2019 Design Manifest, Inc. All Rights Reserved.